When Alexander finished conquering Persia (modern Iran), he burned Darius‘ great palace at Persepolis: only ruins are left today. Then he marched further east with his army up into the mountains of Bactria (modern Afghanistan). Afghanistan had also been part of the Persian Empire, but more than that, it was the land of the Sogdians, the masters of the new Silk Road that controlled Central Asian trade in horses and cattle, silk from China and glass and silver from West Asia. The Sogdians put up a fierce fight for their independence, using guerrilla tactics in the snowy mountains, but without the Persian army to help them, they lost the war. Alexander made alliances with Sogdian rulers and married one of their daughters, Roxane, to help seal the deal. Many Greek and Macedonian soldiers settled in new cities among the Sogdians to watch out for rebellions there, and maybe to help defend the Silk Road. 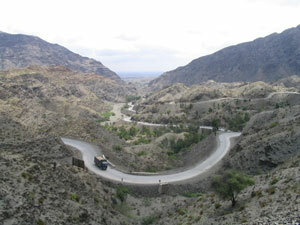 Then Alexander moved south, across the Khyber Pass into what is now Pakistan. 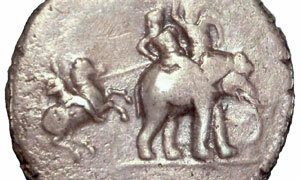 Here he fought North Indian kings and queens Cleophis and Porus and others, and his armies met elephants for the first time. 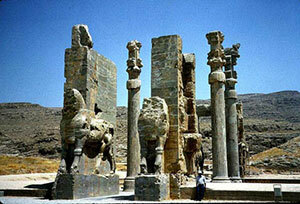 Still he was within the boundaries of the old Persian Empire – but now he had finally finished conquering it all. Should he go on even further east, across the Indus River? What was going on in India? Oxford First Ancient History, by Roy Burrell and Peter Connolly (1997). Lively interviews and pictures make the ancient Mediterranean come to life. For teenagers. Alexander the Great, by Samuel Willard Crompton (2003). For teenagers. Alexander the Great, by Robin Lane Fox (reprinted 1994). Lane Fox is a good writer. The Hellenistic World and the Coming of Rome, by Erich S. Gruen (1984). The Greek World After Alexander, 323-30 BC, by Graham Shipley (2000). Takes a more positive view of the Hellenistic period than Gruen, but it’s not as entertaining to read. Cite this page: Carr, K.E. Alexander the Great and the Silk Road. Quatr.us Study Guides, July 7, 2017. Web. April 22, 2019.